I just wanted to show to more examples of how I use the get-userandpolicy script. In my previous post I showed how to identify specific policies and their associated users. There is another switch included in the script, and that is the "allpolicy" switch. This switch will list a complete set of policies a user object can be assigned to. 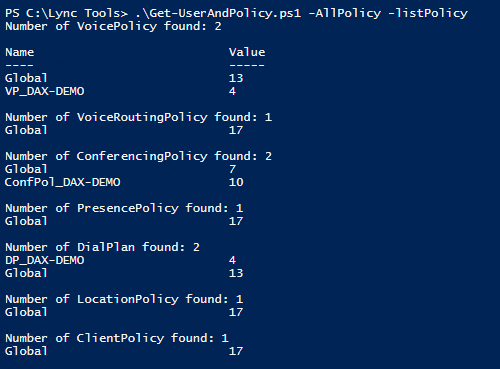 Combining the "allpolicy" and "listpolicy" can give you a complete overview over all your policies and how they are used. 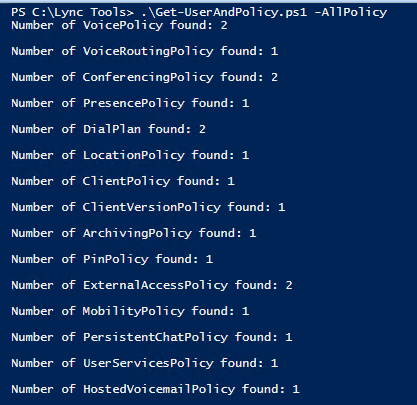 Be cautious when running this in a large deployment, as it can take some time to count the number of users of each policy (as it is currently querying using the "get-csuser" command for each policy count).